Lock in freshness with this clamshell Dart C57PST1, a ClearSeal's product with perimeter seal designed to maximize product freshness and reduce leaks. Bar-locks provide a snap-tight secure closure while easily accessible gripper tabs simplify opening. The two things I was worried about when I ordered this is if the containers were big enough for what I was using them for and can they close shut. Both of these questions were answered and the came out affirmative. I use these for cake layer slices. Great containers, for just about anything. Sturdy, tight close fit, and easy to store when they’re empty. These are not like the flimsy containers you find elsewhere. These containers are great for use on birthdays, weddings or any other events. We also use them when we are going on a picnic. Recommend. Excellent product and customer service. Arrived within the timeframe and with no damage to the packaging. Super durable and ready to use. Plastic is crystal clear and very durable. I was very pleased with this purchase. It was sturdy just like the kind you get at the deli, or better. I make pastries and this item can fit a huge slice of cake or other big portions of desserts or and individual cakes. We order these all the time for baked goods. They work great. They are just as described and are recyclable. They stack and can be stored easily. We use these for salads and sandwiches in my café. They work well at keeping food hot or cold for guest for take our orders. I recommend this product. These containers are perfectly for cake slices up to 3 layers maybe more haven't tried but keeps product fresh up to 1 week refridgerated . I use these for a lot of outdoor and indoor vending events when selling cake slices. I'm using these for my farmer's market table. They worked out great for my lemon brownies with glaze poured over them. I plan on using them for all sorts of goodies. Heavy duty, snap shut tight. I love these containers! They're cheap, and durable. The latches are perfect, and never come undone until you want it. We've kept fresh muffins in them for a couple of days without worrying if they'll go stale or not. Perfect for our vendor shows and donuts. Love that customers can walk around with clear containers to show off our treats. Very sturdy & hold quite a few treats. One of the best containers for Whoopie pies, a slice of pie or cake, and for individual salads. Sturdy, good quality, and priced well. Love that it's clear and people can see the product you have in it. Squeeze the container into itself to seal closed. These containers are expensive but they work good. They are hard to open which means the contents are safe inside but may be frustrating to some. These plastic containers are perfect!! We was them for just about everything in our bakery from holding cupcakes, to cake slices, to brownies. Good thing they come 500 in a case! We love these little containers. We use them for everything from brownies to pie slices to cake slices. They seal good and keep our items fresh! We’ve tried many brands and Dart is the best for these clamshell type boxes. It’s extremely durable and the locking mechanism hold everything in with no problems. I love how customers can see exactly what they ordered. It works great for refrigerated products too! These are sturdy and stackable containers that I’ve used for individual trifles (pictured here) for the cold case, jumbo cinnamon rolls, and even two generously frosted cupcakes. Very affordable, as I haven’t found a better price anywhere else. Great price for these, but inconsistent quality. Some of the containers seemed to be thinner than others and did not close properly. We had to staple some of these closed to keep them from opening up. Use these on a Dailey basis. Best containers that we use. Great price, even after shipping charges they are still cheaper than buying them locally. These containers are perfect for me putting my desserts in. They are strong enough to hold desserts and seem to close tight and form a good seal. Good to go containers for our caramel rolls, cake, desserts, and side orders of fries. They fit well in the 12 # bags for to go orders as well. This is an attractive container for our salads and small menu items to go. We also use it in our bakery to merchandise product. Closes easily and stays shut. We love the size of these containers as they are just big enough to fit our baked goods without having to cram them in. Some of them were defective and would not snap closed so be aware of that possibly happening. Other than that, pretty good product. These hinged plastic containers by Dart are very versatile. They are a heavy duty plastic, and are easy to open and close. Great for sides, salads, fruit, or other deli items. so far so good after receiving this product. Though I only got one chance to use this product to provide customer as fruit plate container. Seems they are satisfied on the size of this container. Excellent value. Half the cost of where I was getting them before which helps me to keep my costs down for my customers. Great for displaying cinnamon rolls! 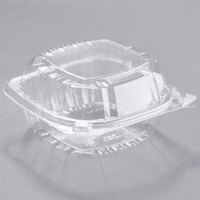 These clear plastic take out boxes are perfect for any deli, bakery or restaurant. Clear container shows your customer what's inside. This recyclable plastic container is a great value. These containers are a great size for side salads and for carry out containers for items such as jumbo muffins and cinnamon rolls. Store flat so they don't take up a lot of space. We loves these containers. The quality is great. They are a perfect size for our cinnamon rolls, whoopie pies and danishes. They also work well cookies and mini loaves. These are great containers for easy take out food. We package grab-and-go salads in them. They stack together nicely, which makes transportation easier. We will continue to buy them. These boxes are a great price, dourable plastic. I need to order more as i go through these quickly. Great product, cost is wonderdul. Love it. Hi, these clear seal hinged lid plastic containers are very useful in our bakery. They hold jumbo cupcakes or large cookies easily. Very nice product! These containers are the best! They are durable, the lid fits easily and doesnt pop open. And they are nice and tall. Was worried they wouldn't fit my cheesecakes but they do! We have been using the containers for a year. They stay closed even when jostled, We use them for jumbo muffins. They also stack nicely, making an attractive display. This container was perfect to pack cookies and chocolate cover strawberries and give it away to friends and family. The high of the dome es perfect band the clear plastic let the berries show. Great quality! Dart plastic take out container are ideal for any café or restaurant looking for a clear container. Made of recyclable plastic, these containers are a nice quality product. We've ordered this product many times as it is the perfect size to package all our baked goods. The plastic is very sturdy and solid and does not bend or break when being open or closed. Love that it is clear so our customers can see our yummy goods right away! The clear plastic is also has a clean look and you can see the product inside very clearly. I love these containers as the are air tight and don't dry out the food that is inside them. they are easy to open and close and are made of a song and durable plastic. LOVE! A thick plastic container that is perfect for taking out our sandwiches. The lid snaps closes quickly and easily. The container also works great for takeout cookies. These are great for fruit salads . The best part is that they stay shut once closed. They do not open by themselves. Its the perfect amount of fruit . Love these. Snaps securely closed. Crystal clear- our half salads and desserts look fantastic in them. Very high-end product for inexpensive price. Will definitely use these again. We use these as a multipurpose packaging container to package slices of cheesecake, mini cakes, and even small sandwiches. They are perfect in size and durability. We have a lot of refrigerated treats and it would be very beneficial for the containers to seal a bit more tight. On a positive note, they are stackable and firm. These clamshell containers were the perfect size for our to-go cinnamon rolls. They snap together well and you don't have to worry about them coming apart! I deliver food and this is a great product. plus fast delivery, I just order almost double the amount. The price I payed for the is perfect as well. These were purchased to sell chocolate covered strawberries and slices of cake. They were perfect for the price and will purchase again when I run out. I love these container. They are the perfect size for my cake slices and cupcakes. It keep my slices nice and fresh. Great quality and i highly recommend. great for our mini cupcakes. We can fit 4 mini cupcakes in this box. The height of this box is perfect as well! the decorations do not get smashed down! Not only do these containers hold various items such as desserts or salads, they are sturdy and are a great price. I highly recommend this product. I use these all the time for my mini cookies, toffee, brittle etc. They keep the product well sealed and fresh for quite a while. They also display my products which makes it easier for my customers. Very nice looking container with an attractive design. Using it for cake slices most. Think, that they are a little small for sandwiches, unless you serve your sandwiches on smaller rolls like ciabatta or toscana rolls for example. Overall, like the product as was able to use it where it fits the best. Awesome!! This container are very useful, I uses for apple pie, tarts, flan and they are very secured, I recommend for single pastry work good. This is an awesome product and a great value! I can purchase it from Webstaurant Store for less than half of the price of my national food service provider! These containers are great and work so well for what we need. We use them for our grab and go items in our showcase like nachos and veggies and dip. These containers are very sturdy and are great for cookies, pastries, candies, etc. I use them to guve my coworkers treats during Christmas. Add a bow and make it extra special. We use this for our french fries and are hot wings, they work great, keeps the food warm and has 2 notches that snap into place to seal tight the container - perfect size as well for the quantity of fries and hot wings we serve - we can fit about 5 hot wings in this box. These containers are perfect for my bake sale. They fit 4 cupcakes or 8 cookies! They are good quality and arrived on time. Thank you! Would order these again thru webstaurant.com! Great deal for the money. Very easy to open and close yet they stay sealed. Nice quality product. I will be using to box up desserts at a reception for attendees to take home. We use these containers for our cinnamon rolls, lemon bars and other pastries. These close well and stay shut during transport. Will purchase these again. We purchased these containers for use at our Greek Festival. They make a lovely presentation case for our assorted Greek pastries and our small Greek salads. We have been using these for quite a while for our farmer's market goods. They are very sturdy. We use them for small pies (they fit 4 7/8" tart pans perfectly). We use them for small bundt cakes. We use them for brownies and other sliced baked goods. We also use them when we sell small salad tomatoes. Clients love the fact that they can see what they are buying. We highly recommend these! These containers were the perfect sizes for my cake slices. They are easy to snap close, and are very sturdy! Great buy! At an affordable price! Great for cold food that need to be on cooler for sale like deli sandwiches or salad.The plastic is strong. Lids are seal good. Recommended! I love these containers it is sturdy, serves the purpose and most importantly my guest like it. It closes very well and keeps food fresh. Great value, excellent product. I bought these to use for my school bake sale and they are very sturdy. It can fit anything from sandwiches , a slice of cake or even two cupcakes. We use these to display and sell our small cinnamon rolls. Works good for this purpose and at a better price then the big box stores or the other delivered services. these were great, the hinged lids word great and stay shut. we used these for multiple used in my bakery! i love this store and recommend this product. Darts quality is 2nd to none! Very sturdy and heavy weight plastic. Keeps all of our bakery goods fresh! I will not order from any other! This product was perfect for our bakery. They are just the right size for single serving cake, cake squares, open and close very easily! Will be ordering again soon. Good product. Ridiculous to ship. Will probably average out to a lot a container after shipping. Find your local restaurant warehouse. Can you afford this for every to go order? Thank you for your review! We are sorry you found the shipping to be too high for this item. Check out Shipping With the WebstaurantStore for ways to cut down on shipping costs. These are amazing container for cake slices and muffins. The icing doesn't hit the top and there is plenty of room for a large slice. These are life savers! We use these to serve slices of pie. We have been through so many different containers but these are the most sturdy and the most economical. Love that they stack easily. These containers are the perfect size for our individual tarts and pastries. They open and close easily without the worry of them popping open randomly. The Dart Solo Containers was the perfect size for my mini bundt cakes and custard pies. I was surprised how sturdy the hinge was, even after stacking them. I will definitely order these again! Such a great product and a super great price! worked perfectly for packaging a dozen cookies! Super sturdy and great quality. Will definetly reoder, as soon as i run out! Great containers! They are just the right size for single servings. Bonus that they open and close very easily! There is plenty of room on the container for your own sticker for branding. This product was perfect for our event!! I'm so thrilled to have ordered it! I will be using it from now on for our Mini Bundt Cakes and Butter Cookies!! Great product! Plastic is very clear as well as bio-degradable and sturdy with a positive locking device. They protect the very fragile baked products I make. Will be ordering again soon. They were the perfect size for our to-go desserts. They were a good quality matierial and we could not find a better price. They were delivered in a timely manner. These containers were exactly what I needed for my home-based bakery business. Airtight, sealed correctly, and stacked well for displaying and transporting. Also, they arrived much faster than I expected! I use these containers all the time for my mobile dessert boutique. They are great for cake, pie, cupcakes. I've even used them for cold salads! This item was a MUST HAVE for our concessions. We used it for sandwiches as well as bakery items. We tore through these. I'll order more next time. We have found several uses for this product. From mini pies to cookies to fudge and so on. This container is very durable. We have dropped these full of product and not even a scratch or dent. The lid snap closes for a tight fit. We use these containers for in house take-out and most commonly for our delivery or pick-up catered lunch boxes where we place the daily salad. These plastic containers are great for all of my to-go desserts, and high enough that the icing or decorations stay pretty. Love the pack sizes! The clarity of this product is amazing! The hinges snap firmly shut and remain so! They can be opened and re-opened over and over again yet still close securely each time! Very nice container for our take out salads, cheesecakes, etc. I was shocked at how low the price was, as we paid more than double this price. They close easier than our old containers and stay closed, great product. These clear plastic clam shell containers are the perfect size for not only our take out salads, but to put pieces of cake and other desserts in as well. Highly recommend. Very useful plastic containers. We use these for our large muffins, crescents, etc.. Very easy to store and easy to use! Less expensive than the containers that we used before we found these! We love to use this containers for our small garden salads, perfect size and presentation. It makes the garden salad look very delicious and also big enough to be able to add the dressing container inside. I love these containers!! They are very high quality, perfectly clear, and come in a great assortment of sizes. We use all four sizes in our cupcake shop for various amounts of cupcakes, and they keep the product fresh even overnight. The weight of the plastic is much sturdier than the generic containers. These Dart plastic hinged-lid containers are very useful for burgers, wraps, tarts and cake slices. The whole containers are fairly-well molded and they protect the inner contents very well. These containers can be stacked on one another. Pull tabs on 2 front corners makes it easy to open the lid. Top and bottom of the container are flat and can accommodate a sticker or a label. I really love this container. It is the perfect size for a wide variety of foods. I have found myself using this for side salads, sandwiches, baked potatoes, desserts, and a bunch of other food items. I also love the convenience of the hinged lid. I never have to fumble to get the top on when I'm in a rush, it's just click and go. Ordered this container to replace one I currently use but which is more expensive. It works perfectly for us! Is a snap (literally) to close and displays delicious slices of our cakes and pies! Ordering the larger size very soon! I LOVE THESE CONTAINERS FOR OUR SMALL SALADS, SMALL CHEESE NIBBLERS, & OUR CROISSANT SANDWICHES. THESE ARE EASY TO SEE THRU & SNAP SHUT GREAT. Definitely love this item. It seals the food and keep it fresh for a long time. The size is perfect for by items, I will definitely reorder. This are extremely useful containers, especially if you are using them to display items. The price is well below what you would pay elsewhere, and they are recyclable. This product is perfect size for to-go sandwhiches, or salads. They close well, staying closed until openned. Moreover, the price is right--this product has enabled us to reduce our costs.